When it comes to great matches, I immediately think of my mom and dad. Naturally, I’m biased, but all six of us kids unanimously agree, they were a great complement, with one enhancing the other. Sigh! Another great combo, 34 years strong, is me and my guy Ger; we are a different sort of duo. We are better together because we contrast. He has attributes that I don’t have and I have others he doesn’t. It’s amazing how even though different, both types of couples are better together. The complement or contrast combination is also the rule of thumb when making great food and wine pairings. Take for example the lovely complement of a crisp Pinot Gris served with a delicate fresh fish versus the contrast of the dry tannins of a cabernet cutting the fat of a delicious steak. In either combination you are “marrying up” and what we get when we combine these lovely ingredients is called delicious. Delicious flavor is composed of an intricate synthesis of taste, smell, texture, temperature and irritation (think hot chilis or high alcohol content). Taste has to do primarily with the mouth and the arrangement and number of taste receptors you have. In fact, research has determined that your taste buds are not just located on your tongue; your whole mouth gets to participate. You have receptors on the upper soft palate, epiglottis, esophagus and even in your lungs. As for your sense of smell, it actually deserves more credit for flavor than your mouth. The nasal olfactory receptors are so key, just plug your nose and taste your wine and see how well you do. It’s a non-starter. The most important element in pairing wine and food is weight and texture. Light foods are best with light wines and heavy, bold foods can handle more robust wines. 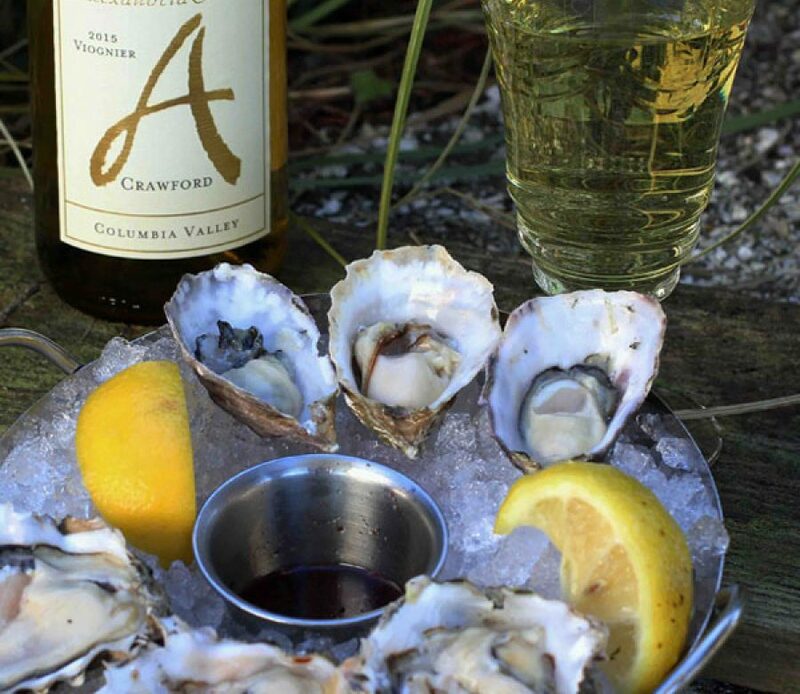 Acidity can balance salt, so cleansing champagne can enhance a lovely fresh briny oyster. Hey, sweetness, if you are serving dessert, do make sure the wine is sweeter than the food or it will taste very flat. The main thing is that everyone’s individual taste preferences vary. If you want a really nice list of pairing suggestions go to http://www.williams-sonoma.com/pages/guide-to-wine-pairing.html, but remember it’s really up to you. And … if you would like to know my all-time go-to favorite food and wine pairing, I’ll tell you. It’s the marriage of Taylor Shellfish’s Shigoku oyster and Alexandria Nicole’s Crawford Viognier finished with Salty’s own raspberry mignonette. Now that’s my match made in heaven! I also highly recommend our Chef Jeremy’s delicious ideas on togetherness in his blog that includes a recipe for his fave seafood pairing: Seared Easter Scallops with Bacon Relish and Sauce Chimichurri.